This is an excellent post. I've unschooled my now 16 year old daughter her whole life, and you have perfectly addressed all those things I graveled with on our journey. I needed to see this at exactlythis time! This is the first my kids didn't have to go back to prison,uh, I mean school,and we are really enjoying the process so far. We are still deschooling but it is moving nicely, I think. The biggest issue we are having is the people outside of our family who don't understand. Thank you so much for helping me with that! Idzie, you are such a lovely voice, and a lovely person. I miss you - but know that as my own kids get older (15 and 12 already?!! Wait - HOW?! ), it's the older unschoolers like you who have helped me on this journey. You're so generous with your experiences, and you have incredibly skill for expressing them in writing. 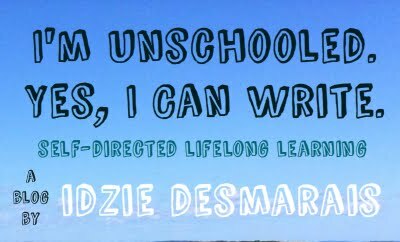 Deschooling - the perfect term for what I see happening in my daughter right now. We pulled her out of middle school prison after her first couple weeks as a sixth grader. 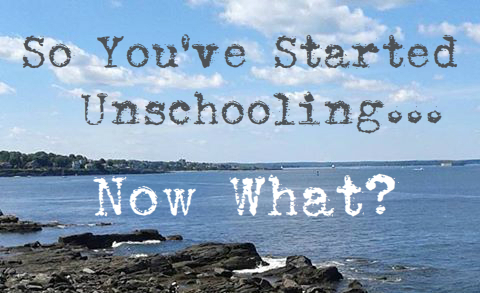 We're trying to find our groove as a homeschool/unschool family. Some days, we fly through math stuff and she wants to know how to solve equations and is really motivated to finally "get" fractions. But we've had a lot of days when that isn't happening. Yesterday, she spent all day practicing with a magic kit she picked up at the museum gift store. I've worried and struggles with how to explain this to nosy family and friends. I'm so glad that I stumbled upon your blog! It is exactly what I needed!